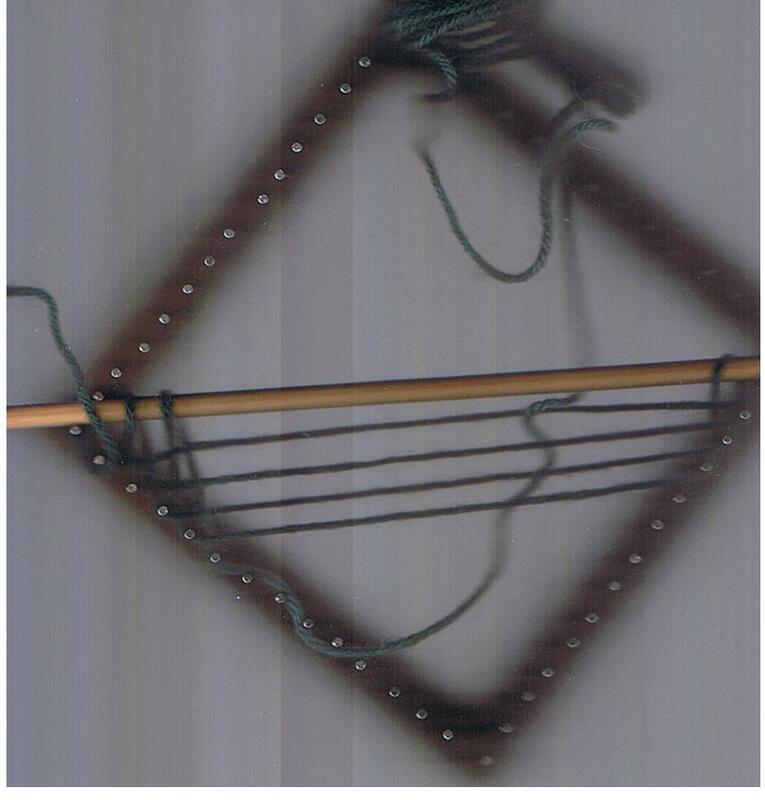 a mini triangle loom, with the addition of a thin dowel across one diagonal. as its one half of the square loom, you make exactly one half of the movements. 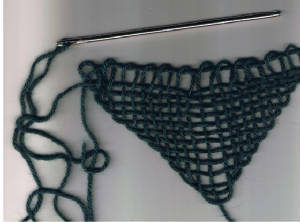 Starting at the left hand side, tie your yarn, then bring the yarn across to the nail on the opposite side of the triangle, take it around the nail, then up to the dowell. It is very important that your ball of yarn remains towards the top of the loom, and in front of it, to stop it getting tangled. Loop it over the dowell, then using the over/under movement you used on the square loom, bring it down to the next nail on the same side, before bringing it across to the left side again. As you can see from the completed tri, its very easy to see which side goes over and which side goes under, and pick up any mistakes you might have made. To take the tri off the loom, I generally use a locker hook at this stage, as it has the advantage of a crochet hook one end, and an eye at the other thats big enough to use with 8 ply yarn. I just run it along the top, putting in an extra row, and making sure that I keep the over/under sequence correct. Keep the tri on the yarn as you lift it off the tri. 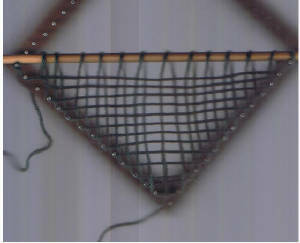 Then you will need to weave any ends into the fabric, and probably sew around the edge of the triangle to strengthen it. This is as far as I go if I am using it as a leaf with a loom bloom, but for this exercise, it will form the basis of an amulet bag, so I have not yet sewn the thread ends in. this will give you a small diamond shape that is open two sides at the top, and down the centre back, and ready to be embellished as you want. If you are going to thread ribbons or other yarns through the fabric, I would suggest neatening the loose ends, but not actually sewing up the bag until you have finished any further weaving, embroidery or whatever, as its far easier to embellish a flat surface. You will need to decide if you are going to leave the bag open, or sewn shut, in which case add your charms, messages, or healing crystals before you sew it up. You can add a pretty button with a loop fastening at the top, turn down the top a little way, go crazy with ribbons and beads with a fringe, the choice is yours! Once sewn up, using the same yarn you wove the bag in, the seams are just about invisible. For stringing it, a simple I-cord, made in matching yarn on a knitting jenny would be ideal, as would a simple card-woven strap.You could even use chain, particularly if you have used a metallic yarn to weave your bag. 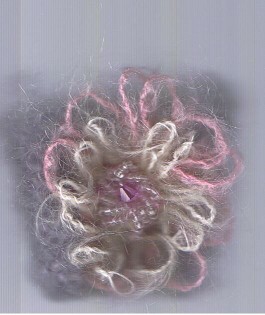 Or experiment weaving with soft jewellery wire! It comes in great colours. Of course, your triangle does not have to be an amulet bag. As its one half of your square loom, its ideal for making a woven patchwork afghan or blanket. In fact some people call these small looms patchwork looms. Or you can line the piece, and use it for pot-pourri, for your clothes drawers, or on a keyring embroidered with an initial. You can experiment with rainbow yarn, space-dyed yarn, ribbon, raffia, or other fibres. And I am sure that any daughters of the right age will quickly notice that they are ideal for making dolls clothes! 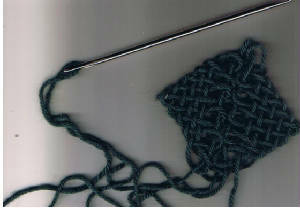 And if you use cotton thread doubled, you can make a basket weave base that can be used for tapestry and cross-stitch, and even experiment with hardanger!